Medicalchain — the future of healthcare. I am extremely proud to be working with the team at Medicalchain. As a clinical advisor with a special interest in all things blockchain, I am excited to be a part of building the future of healthcare. Over the next month I will be writing a series of articles on how we as a team intend to bring this change to patients and professionals all over the globe. Please feel free to get in touch with questions or comments. The article presented here is an overview of some of the features of the Medicalchain platform and a brief vision of things to come. Please come back weekly for more in depth analysis. Using blockchain technology, smart contracts, and our cryptocurrency, Medicalchain provides the infrastructure upon which digital health applications and services are to be built. These applications and services will be seamlessly powered by user’s health data. Anyone will be able to develop on Medicalchain’s platform and we hope to foster a thriving ecosystem to provide value, reduce costs, and ultimately improve people’s lives. We take privacy and security extremely seriously and are working with global experts to ensure patients and professionals can trust in our platform. This includes dealing with the large problem of identity fraud. Hackers steal identities and impersonate users incurring huge costs for users and service providers. To combat this, Medicalchain has partnered with Civic and will use Civic’s user authentication services to easily and securely manage the identities of users in a decentralized way. Civic identifies and verifies users using biometrics, which provides a simple and safe way of ensuring user’s privacy. This is only one (but important) aspect of how users’ medical records will be secured. Allow me to elaborate. Medicalchain is built using a dual blockchain structure. The first blockchain controls access to health records and is built using Hyperledger Fabric. The second blockchain is powered by an ERC20 token on Ethereum and underlies all the applications and services for our platform. The Hyperledger blockchain network is permission based and requires users to sign up to use it. Permissioning on the network is controlled using Hyperledger modelling and access control languages. Hyperledger Fabric is a platform for distributed ledger solutions underpinned by a modular architecture - delivering high degrees of confidentiality, resilience, flexibility and scalability. Medical information is often highly sensitive, in both a social and legal sense. Therefore a closed blockchain such as Hyperledger Fabric helps to retain the necessary privacy required for such an application. Hyperledger Fabric is a safe solution for managing access to health records, as it accommodates multiple layers of permission, meaning the owner of a set of data can control which parts of their data is accessed. Ethereum is an open-source, public, blockchain-based distributed computing platform featuring smart contract (scripting) functionality. It provides a decentralized Turing-complete virtual machine, the Ethereum Virtual Machine (EVM), which can execute scripts using an international network of public nodes. Ethereum also provides a cryptocurrency token called “ether”, which can be transferred between accounts and used to compensate participant nodes for computations performed. “Gas”, an internal transaction pricing mechanism, is used to mitigate spam and allocate resources on the network. Numerous applications have been built using the Ethereum blockchain, many using their own native currencies or tokens. Our platform takes advantage of this incredible resource and offers an ecosystem for developers to contribute applications using our MedToken. Smart Contracts are code held and executed on the Ethereum blockchain. Anything that can be programmed normally can be programmed within the Ethereum network. Processes that normally require a professional or notary can be automated and validated by smart contracts in a wholly transparent and secure way. As an example, the average physician spends 3.8 hours weekly on billing and insurance related activity. We envisage enormous cost savings if these processes are automated on smart contracts and validated by the Ethereum network. Patient owned electronic health records (EHR) will enable several features to be used in conjunction with the Medicalchain platform. 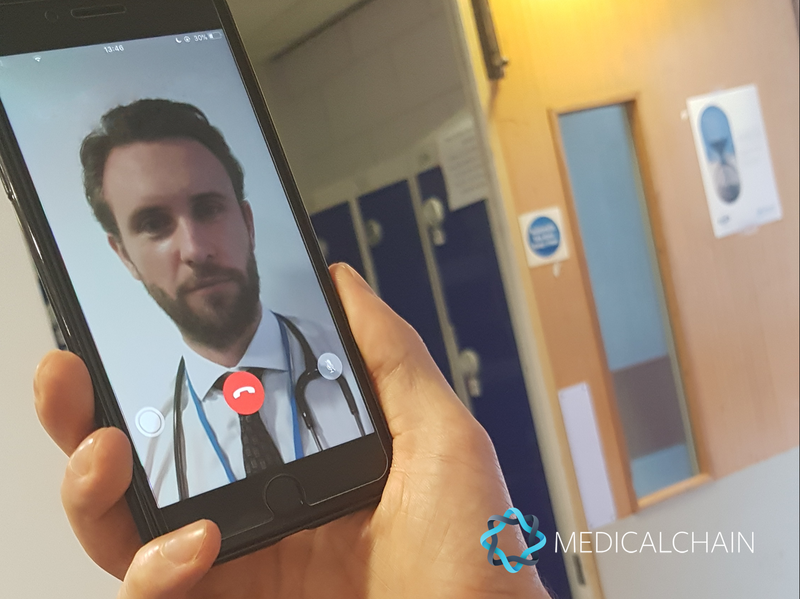 Telemedicine, an online interaction between a doctor and patient using a webcam interface, is increasingly becoming a major method of healthcare delivery. It negates the time and logistical hassle required to visit the doctor’s office, but provides a remote audiovisual consultation (at a convenient time for patients) which is sufficient for most simple medical complaints. It also affords patients greater choice as they are not limited to a specific local doctor when seeking medical advice. Doctors also benefit from engaging with this technology. Telemedicine enables flexible working hours and the ability to work from any location that enjoys adequate internet connectivity. Additionally, by being granted access to historical health records by their patients, doctors can confidently make better informed clinical decisions about further investigations or treatments. Medicalchain is not the only provider of this well established format of consultation, but uniquely also enables the doctor to interact live with the patient’s longitudinal health records during the consultation. This content and time limited access is granted by their patients — allowing for a more in-depth, informative, and valuable experience for both parties. Consistent with the founding principles of Medicalchain, patients should have control over their health records, and they should also benefit from the potential value that they possess. Medicalchain will connect research institutions with users willing to have their health data used in studies in a health data marketplace. Users will be given clear information as to how their data is being used and what data will be required. In many cases anonymised data will be permissible, ensuring the privacy of everyone involved. In return, participants will be compensated in our cryptocurrency (MedTokens). Patients will be given the ability to unlock the monetary value that their health data holds and potentially be more engaged with their health conditions. Pharmaceutical and research companies will also benefit from engaging with Medicalchain. They will be able to seek out patients who have opted in to being contacted - no longer needing to approach a hospital or clinic for patient information. Not only will this increase efficiency, but it is a more transparent process that strikes a relationship which is symbiotic, sustainable and encourages patients to play a role in research about their own health problems. I hope this brief overview has excited you enough to return for a more detailed look at what promises to be an exciting look at the future of healthcare. If you have comments or questions, please email me using stewart@medicalchain.com. See you next week. Blockchain Consulting to the Healthcare Industry. Medicalchain is a decentralized platform that enables secure and transparent exchange and usage of health records.